Our Brookfield Farm honey’s pulled, extracted, and on our market tables now. 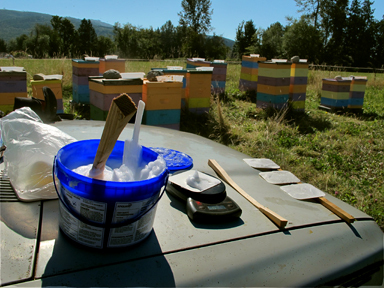 Now the work begins to prepare the bees for winter. Which arrived here suddenly.We went from a lovely warm summer to an early “fall.” Here that means weeks of unending rain and often high winds, with brief breaks where sometimes the sun makes an appearance. As I pull honey I distribute honey to those hives that have not put up enough stores. I like to leave around 70 pounds (around 31 kg) of honey on the hives in the winter. So that work was already completed by extraction. 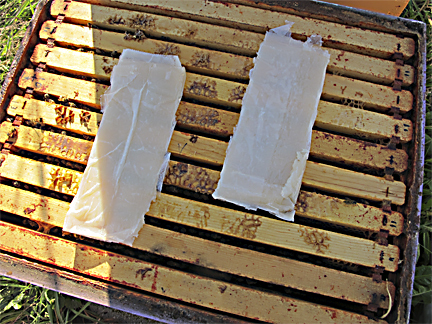 I use a “natural” treatment for varroa every fall. The treatments are natural substances which are found in the hive, but I must admit that in nature there are no little forest elves running around hives putting in formic acid or thymol (thyme oil). 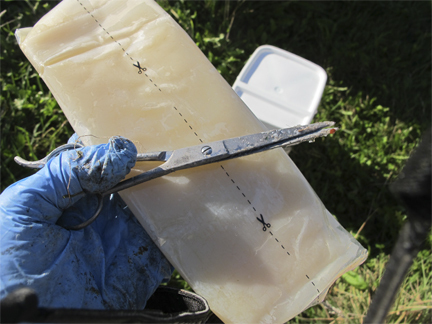 This year I used formic acid pads : Mite Away Quick Strips . These are formic acid pads. Formic acid occurs naturally in bee hives. I like these because they are an easy one-time item. Cut the packet open, separate the two pads, put them in, then one week later remove them, and you’re done. 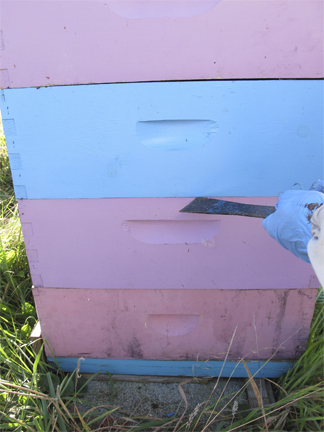 The strips are put in between the boxes with brood. If there is only one box of brood, the strips are put on top of that brood box. Of course the bees are moved off the top bars first. 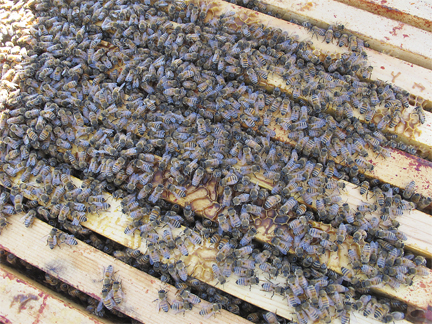 Then the boxes of the bees’ honey are then put back on top of the brood and the strips. Temperatures must be over 50F (10C), and below some other number. I never note the higher number. Here the hope is that our variable weather will stay above 50F. Warnings: This is acid, and the company makes that clear (did you see the “poison” marking on the box in picture?). Wear gloves, and have a few pair if you’re using painters gloves. Next year I’ll use Apiguard as I did last year . This is a thymol based varroa treatment. It’s a bit more involved. You must put some on a card, and insert the card in the hive. Seven days later you do it again. Seven days later, you remove what’s left. It’s more work. I alternate between the two treatments because I don’t want the mites to build up a resistance to either method. There’s no science behind this, just my own experience with livestock – the four legged kind. I have pack goats (and once raised Cashmere goats, Shetland Sheep, and Jacob Sheep). Goats get lice. One treats for lice, but never using the same treatment every year, because the lice will become resistant. I figured that probably applies to all parasites. Nosema is a real killer here in Washington state. Nosema apis is tied to cold, wet weather. Did I mention that it’s raining? Have I mentioned that it will normally rain, or snow, from October to February here? It’s green. It’s beautiful. The rivers are wild. But it is wet. Nosema ceranae can apparently hit in any weather. 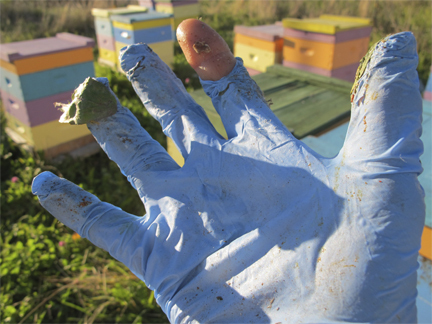 Last year I ran an experiment on my hives with Nosevit. Nosevit is from plants and, apparently, tree tannins – and has been used in Europe for quite a while. 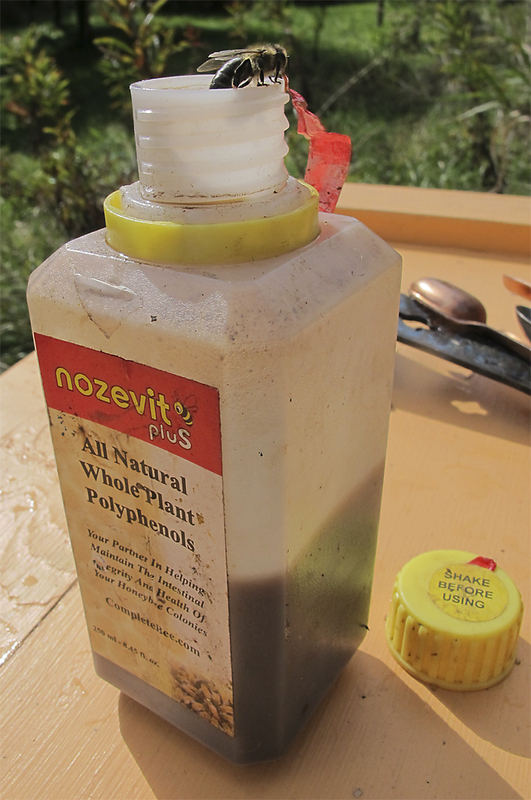 I put Nosevit in the feed of ½ of the hives in one up-river bee yard, and in one down-river bee yard. I had good results so this year, I put it in everyone’s feed. I do wonder about its effectiveness. Most formal studies I’ve seen are not very positive. And I do wonder about a company that seems to have no website in these days of “the internet is everywhere”. I shall continue to ponder my continued use of it. In the mean time, the bees seem to like it. I feed for three weeks in the fall, after harvest. Then I feed again in the spring, three weeks before the honey flow comes on. This is where I give the bees their essential oil. This is the recipe I use at this time (scroll down the linked page). Again, no science here. I got the first recipe off the web. Then read that Tea Tree Oil could replace some of the Spearmint. A lot of good words were being said about Tea Tree Oil, so I tried it. More hives survived, so I keep doing it. I feed a sugar cane syrup / water mix. It’s about 1 : 1 or 1.5 sugar to 1 water. I do this by volume. I fill three huge pots to just under half-full with water. The rest is sugar. I usually use rainwater – we have a lot of it here. I stop feeding after three weeks. 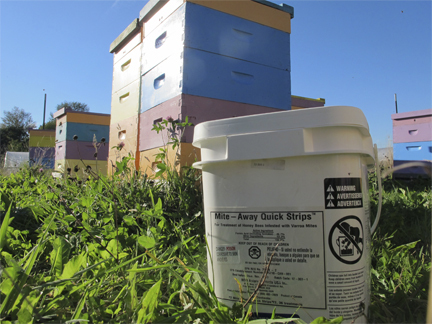 Many of the hives do not touch their feed – there is a lot of honey on these hives. 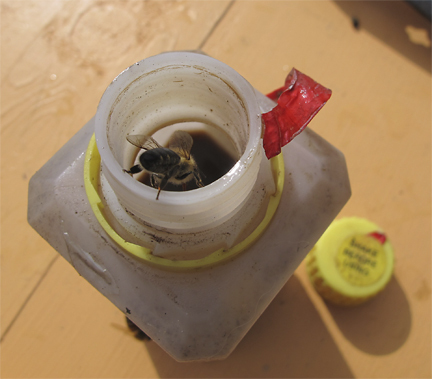 Some consume it rapidly, even with honey on the hives. Each hive is an “individual”, so I figure they’re doing what’s good for them. The feed is pulled at three weeks for two reasons. I’ve found over the years that three weeks of essential oils seems to be enough for the bees over wintering. Plus, on a normal year, our heavy rains start in mid-October. Liquids in the hives during heavy rains are not a good combination. 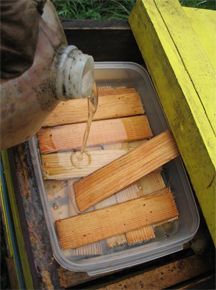 Rainwater seeps into everything here, so an added container of liquid in the hive makes it harder for the bees to get rid of excess dampness. That’s the news from Brookfield Farm Bees And Honey, in Maple Falls, Washington. We actually had a day of sun yesterday. The bees seemed to enjoy it, as did I. How are your fall – or spring – preparations going? 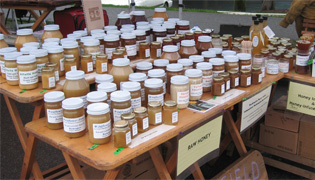 This entry was posted in Beekeeping, Diseases and Pests, Feeding Bees and tagged Brookfield Farm, honeybees, Maple Falls, mite away quick strips, nosema, nozevit, preparation, varroa, Washington, Winter. Bookmark the permalink.